Mandy is a retriever mix that looks like a flat-coat retriever. 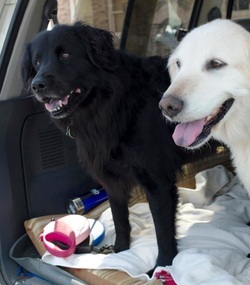 On January 11th, 2013, she was riding in the car with her adopted sister, Lady, a blonde retriever mix. Both dogs are at least eleven years old. Their guardian, Earl, is 86, and he was driving with his friend, also named Earl. They were in an accident with a BMW near the gas station at Juanita Drive and NE 141st in Kirkland (18 blocks from Earl’s home). Earl’s car hit the pumps at the station, and caught fire. Both men got out, with minor injuries, and they gathered Lady right away. Mandy was spooked by the accident, and she ran across the street toward the woods, toward St. Edwards State Park, which is 316 acres with miles of trails. Two days after the accident, Earl called me (Three Retrievers Lost Pet Rescue) to help look for Mandy. I would like to have started my tracking dog, Kelsy, on the scent trail, but Earl could not find anything with just the scent of Mandy and not Lady. Mandy was still wearing her blue harness, which would have been the best scent article. I interviewed Earl to learn more about Mandy and her past behavior and experience. I learned that Mandy’s other owner, Earl’s wife Nina, had died unexpectedly of a sudden illness on December 30th, less than two weeks earlier. Mandy and Nina were very close, and Nina was the one who usually took Mandy and Lady for short walks. I also learned that Mandy had been adopted in February of 2011. Before that, Mandy had belonged to a family in Bothell, 7 miles away, for 9 years. The mother of that family died of cancer, the family lost their home, and Mandy went to live with relatives in Skagit County during the transition to a new home. Mandy escaped, two years ago, and she was running loose in a neighborhood for at least seven weeks before being trapped in a humane trap. When Earl and Nina adopted her at the Skagit Humane Society in 2011, she weighed just 45 pounds, 30 pounds under her ideal weight. Nina and Earl nursed her back to health. They also successfully treated Mandy’s cancer, and Mandy had healed from that surgery two months prior. I learned that Mandy always barked at anyone coming in the home, and she was generally fearful of strangers. Mandy and Lady were very close, and Lady could be used to attract Mandy once her location was narrowed down. Based on my knowledge of Mandy’s history and personality, I figured she would not come up to anyone, or allow anyone to catch her. I set up a wildlife camera and a feeding station in a quiet area behind a church, near the last sighting. I also recommended large neon posters in order to generate more sightings. Many volunteers helped search for Mandy, including Irene, who lived a few blocks from the crash site. Irene wore a hat with cat ears, and she had sixteen cats at home, many of which she was fostering for a local cat rescue group. 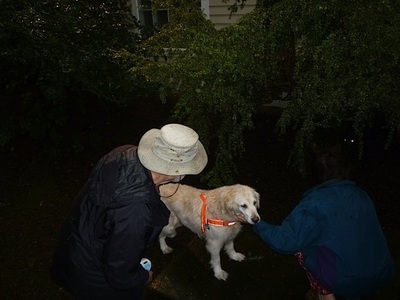 Local volunteer groups such as MEOW Cat Rescue had been spreading the word about Mandy, and many people volunteered to help with the search. Irene in particular was often out looking for over eight hours a day, and I would estimate that she invested over 100 hours of her time in the two weeks Mandy was missing. We received several sightings of a dog that looked like Mandy, and Irene was usually the first person I called, since she lived right there and I lived an hour away. All of the sightings were within a mile of the crash site. Based on what I knew at that point, I organized an Intersection Alert for Saturday morning, eight days after the crash. About 35 people showed up, mostly due to people sharing Mandy’s story on Facebook. Eight people held up signs at two intersections on Juanita Drive, and the rest searched the woods south of the crash. This area had more woods and more trails than most other neighborhoods in the Seattle area, and the searchers handed out fliers to people walking their dogs or riding bikes through the woods. Of course it was freezing, and the people holding up signs at the intersection had the worst job. One woman came from West Seattle, and hour drive, and held up her sign for eight hours that day despite having pneumonia and lung cancer. I asked her to go home and take care of herself several times, but she said she couldn’t rest knowing Mandy was out in the cold. While we were holding up signs, a woman pulled over to tell us she witnessed a black dog being taken away from the accident scene, to a nearby doctor’s office. This turned out to be the dog from the BMW, who was reunited with his owner at that time. Because of the signs, the fliers, and Facebook, and because of articles in local papers, many people knew about Mandy. By the time she was caught, over 400 people were following Mandy’s story on Facebook. Because of the successful awareness campaign, we got a sighting of a dog that looked like Mandy, ten blocks east of the crash site. This woman kept watch of this Mandy look-alike while volunteers were scrambled to bring Earl and Lady to that location. It turned out this dog was named Lucky, and he lived near there. Lucky may have been responsible for over half of the reported sightings. This was valuable information, though, and it told us that Mandy may not have wandered as far from the crash site as I had been led to believe, based on the previous reported sightings. I always ask the dog’s owner, and those assisting, that they get as much detail about sightings as possible, including contact information so we can call the spotter back. This sighting of Lucky was the first where I could actually call the person back, and follow-up calls helped us learn that it was not Mandy after all. Also, the wildlife cameras were not picking up anything. On the 25th of January, I planned to spend all day looking for Mandy, putting up fresh posters, and interviewing people in Lucky’s neighborhood to try to determine how many of the sightings might have been him. I got a call from Earl at 8:00 saying Mandy had been sighted two blocks west of the crash site at 7:30 that morning. Earl had trouble getting Lady in the car, and Earl’s son in California thought that Earl probably shouldn’t be driving at all, especially not at such a time of intense emotions. Earl did get in the car and get underway before a volunteer could get to his home. Then several people met him at Denny Park, and drove him around for the next two hours as at least a dozen people tried to pinpoint Mandy’s location. Earl and Lady walked along the section of Holmes Point Road where Mandy was last seen, but she didn’t come out to them. About 11 AM, as I was driving to the area, I got several calls that Mandy was located, that some people on bikes were chasing her (despite my repeated, emphatic advice to anyone who would listen that no one should try to catch or chase Mandy under any circumstances), and that one person actually had his hands on her before she escaped again. I called Earl and directed him to the location where a woman said Mandy was lying in her yard. I was on the phone with another volunteer when I heard the description of Earl finding Mandy (as I was driving down I-405, still miles away). I heard lots of excited exclamations and crying for several minutes, and then lost the connection. I thought of the scene in Star Wars where Luke and Leia are in the trash compactor and C3PO mistakes their cries of joy for cries of agony. I was relieved to learn, a few minutes later, that all the excitement was about Earl and Lady being greeted by Mandy. In pictures that I saw later, you can see that Mandy is hiding in the bushes, just a pair of reflecting eyes, as the volunteers keep an eye on her and stay back. In the next picture, she sees Earl and Lady, and she comes out to greet them. I had said from day one that Mandy would come right out to Earl and Lady, once we established her location, and it was gratifying to see it worked out that way, even though I wasn’t quite there to witness it myself. -- Don’t chase, call the name of, or try to grab a lost dog. It almost never works. Get that dog to come to you, or use a humane trap. In this case, they did chase and grab at Mandy. Most likely, she would have been rescued hours earlier if people would have used calming signals and guided Earl to the location of the sighting. --Publicity about your lost dog will likely be the difference between finding or not finding your dog. You need to get the word out that your dog is missing. Someone has seen your dog, but they won’t know to call you if you don’t spread the word. --Facebook is an effective tool for spreading the word, but you also need to use it to get all your volunteers working together. When you have dozens or hundreds of people volunteering to help with the search for a lost dog, that's great, but you need to make sure they aren't going off on their own. One individual may take actions, with good intentions, that undermine everything the group has worked for. The person on the bike chasing Mandy, against instructions, got lucky when Mandy ran into a yard and hid under a shrub. Mandy could have just as easily run onto a busy street and been hit by a car. --Most people feel like giving up the search for their missing pets at some point. Those people who work past those feelings and keep looking are often rewarded for their efforts. The number one reason that people don’t find their pets is because they stop looking. Earl said, many times, that he felt hopeless about finding Mandy. He asked me what the chances were that he would find Mandy alive. I told him, based on records from hundreds of missing pet cases, that he had at least a 70% chance of finding Mandy if he didn’t give up. 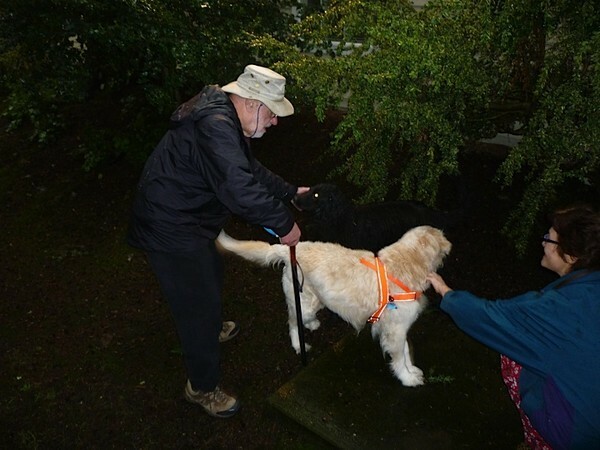 With help from his community, Earl was able to keep up the search. Mandy had lost 12 pounds in 15 days because her fear of strangers was stronger than her need for food. Without the persistence of Earl and his team of volunteers, Mandy might not have survived if no one ever knew she was hiding in those woods. Before the 25th, it had been five days since we’d had a sighting, which we later learned was probably the wrong dog. Many people were feeling discouraged, but they didn’t give up. Because they kept spreading the word and kept searching, Mandy and Earl get another chance. Earl has also said, many times, how thankful he is for this community of animal lovers that banded together to save Mandy. If Mandy knew how many people worked hard to save her, I’m sure she would be thankful, too.